In a digital battlespace reliant on the Global Positioning System for positioning, navigation and timing, trust in the veracity and security of the GPS signal is critical. The Canadian Army is aware of the vulnerability of GPS to jamming, spoofing or other anomalies and has collaborated with defence researchers and industry to develop anti-jamming solutions, especially as more and more equipment and weapons have become GPS dependent. In December, the Army took a major first step to ensure the accuracy of satellite information for artillery units in a GPS-contested operating environment, signing a CAD$1.3 million contract through Public Services and Procurement Canada with Calgary-based NovAtel for 52 units of its GPS Anti-Jam Technology (GAJT-710ML). The antenna will be installed on the Army’s LAV-6 observation post vehicles. The antenna works with an array of military and civil receivers, including the Army’s handheld Defense Advanced GPS Receiver (DAGR). As much as the contract fills an obvious capability gap, it’s also a poster child for how the military and industry can work together to take an idea from a prototype to a commercial product. NovAtel first demonstrated a proof of concept to Defence Research and Development Canada (DRDC) in 2009 and has been sharing prototypes ever since. The first self-contained null-forming anti-jam solution for land vehicles, GAJT-700ML, was launched in 2011. In March 2014, under the Build-in-Canada Innovation Program, DLR took it a step further, sponsoring a trial with the Army’s Quality Engineering Test Establishment, the Trials and Evaluation Unit, and DRDC on a LAV III observation post vehicle (OPV) in Petawawa, Ont. The 2nd Regiment of the Royal Canadian Horse Artillery provided two crewed OPVs. “GAJT is a great example of a technology with its roots in research that has evolved through years of work into a product that the [Canadian Armed Forces] can use to their advantage,” Mike Vinnins of DRDC’s navigation warfare group said at the time. The trial of five GAJT units not only validated the technology, maintaining access to the GPS signal in a DRDC-created adverse signal environment, it gave NovAtel engineers an opportunity to observe the testing process and understand some of the challenges of meeting military specifications, for connectors, flexibility of cable wiring, and ideal form and fit within a vehicle. It also provided NovAtel with a detailed unclassified report on the trial findings and recommendations. The Army feedback helped NovAtel spiral GAJT into a stronger product. The report, moreover, gave the company something tangible to share with NATO countries, which has since led to sales or trials in 16 countries to date, including sales to the U.S. Naval Observatory for use in the Department of Defense Information Network and for the United Kingdom’s Type 26 frigates. NovAtel has also produced GAJT in a form factor for use on smaller platforms such as Schiebel Aircraft’s Camcopter S-100 to ensure flight path integrity. “We are getting a lot of interest from people who have timing as part of their problem,” said Soar. As militaries have acquired digital fire control systems, meeting the demand for reliable and secure positioning, navigation and timing for precision munitions was an obvious place to start. Moulton said other applications for GAJT or other anti-jamming technology would be evaluated as the need arises. “It can depend on form, fit and function for the vehicle it is going on, and what level of assurance you need on that particular platform,” he said. Under a second BCIP trial in 2016, the Army tested GAJT-AE-N units, in mounts designed by the Army, on a M777C1 lightweight 155mm towed howitzer in Shilo, Manitoba to prove its robustness under extreme vibrations. 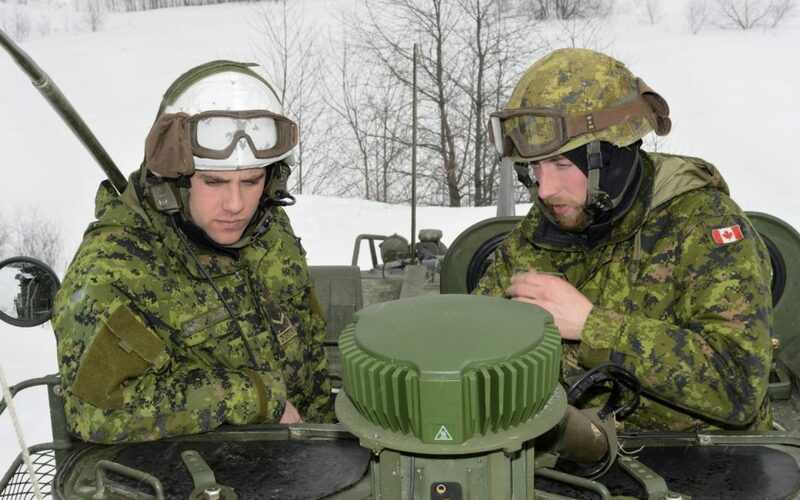 Like many allies, Canadian artillery employs GPS Inertial Navigation Systems on their guns. To prevent jamming, the artillery used to turn off the GPS system once the gun was in action and ready for firing. With GPS-guided ammunition, however, “you cannot operate without a good, reliable GPS signal at the gun end,” said Soar. A former gunner with the British Army, Soar understands the problem firsthand from his experience in the 1980s with relative positioning where, “I knew where my guns were to the nearest 10 metres, I could work out where the target was to the nearest tens of metres, drop a few shells, adjust the fire and hit the target.” The game has completely changed, he said. Western militaries understand the advantages and disadvantages of GPS but have only recently started to address the vulnerabilities, he added. In a survey for a government customer on the use of handheld GPS systems, he found 50 percent of soldiers were using privately purchased systems that looked like military kit but were unencrypted and highly vulnerable. For DLR, the contract was another example in recent months of how quickly a minor capital project can be delivered. Following the December contract signing, the first 10 units were produced and delivered to the Army by early January and, following acceptance testing, the remaining 42 were in hand by mid-February. The Army has since worked with the prime contractor for the mission systems on the OPV, General Dynamics Missions Systems Canada, to integrate the antenna into the vehicle, with the intent of providing GAJT to the field force to install over the summer. As complimentary as NovAtel has been of the Build-in-Canada program and the Army’s approach to the trials, Moulton has been equally impressed with the company and its production capabilities.